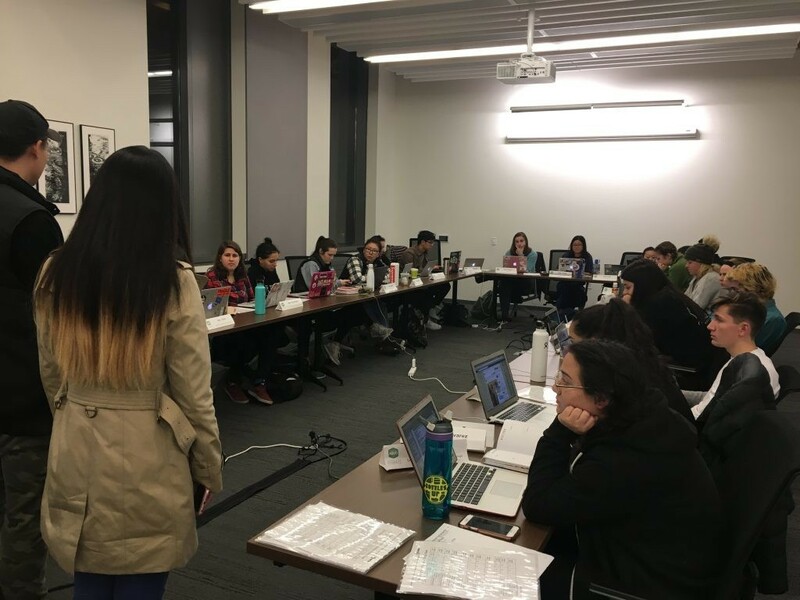 Every year, the Associated Students of the University of Oregon, better known as ASUO, pull together to decide which programs at the University of Oregon will benefit the student body. One program in particular that the ASUO has had success with is their Shuttle Service. The ASUO has made sure that there is reliable transportation for University of Oregon students at the push of a button; well, 7 buttons. Currently, the ASUO has three branches of their shuttles service and Lindy Mabuya, who occupy’s Senate seat 3 where she holds responsibilities as finance committee chair, took the time to tell us all about them. University of Oregon representative Lindy Mabuya. “We have 3 types of shuttle services: we have an accessible shuttle service…for anyone who needs aid getting to campus…from sun down till midnight we have the assault prevention shuttle that recently changes its name to safe ride….and a designated driver shuttle which operates from 10pm-3am,” says Lindy. The shuttle service at the University of Oregon is being considered for larger amounts of funding, says Lindy, because the ASUO recognizes how vital this service is for the student population. Even with more funding, Lindy believes there a several flaws that could be fixed with more investment. The students who run the shuttle service are responsible for asking the ASUO for funding increases where they see fit. When asked about how communication works between ASUO and the program, Lindy says, “We do take a holistic view at how the program is looking so the program has the opportunity themselves to come before us and advocate for an increase and they can give us a variety of different reasons.” It is during the winter term that programs like the shuttle service are given a chance to ask for funding increases. This is a completely student run program and is also fully funded by the ASUO. Lindy feels the Administration at the University of Oregon could provide additional funding, which would help the shuttle service a great deal. “It is primarily students that run this program which I think is phenomenal because they are working incredibly late hours,” says Lindy. Additionally, she is confident that the ASUO will do their best to make this program even better. “We try to do as much as possible with the restrictions that we have,” she adds. Even with the restrictions, it seems that students at the University of Oregon appreciate the shuttle service, and the ASUO staff will ensure it gets better each year. Undoubtedly, with a free shuttle service, these University of Oregon programs are making a difference, especially for students who may otherwise be in unsafe conditions. However, without the ASUO and their ability to disperse funds to student groups, who knows whether or not the student shuttle would exist.